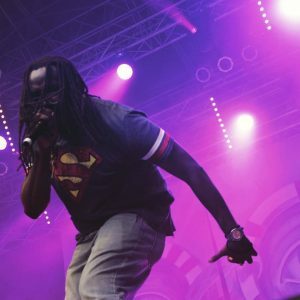 Randy Green, aka R-Son – The Voice of Reason at a Gangstagrass performance. Before heading off to Europe for a two-week tour a few months back, I got to speak with the multifaceted Randy Green, aka R-Son – The Voice of Reason. 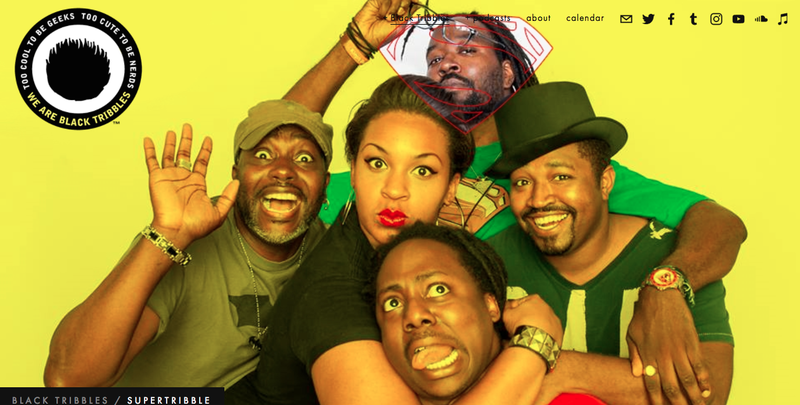 He’s a part of the Bluegrass Hip-Hop group Gangstagrass, aka The Super Tribble of the popular podcast crew of comic heads and sci-fi fans of color the Black Tribbles, and a member of the braintrust behind Philadelphia’s Amalgam Comics & Coffeehouse, a community forward establishment for blerds and bleeks. BlackSci-Fi.com: For our readers please give us a little bit of your musical background and how you started. Randy Green: I’ve been rhyming since I was… matter of fact the first verse I wrote was in the back of the school bus in the first grade. Me and my partner Quincy, he was Master Q and I was Disco G, and we wrote off and on from then. When I got to Penn State, 95-96, we would just hang out doing freestyle. My man Lewis was like “look you’ve actually got some talent you should try and do something with this“. So I really started writing, put something together and dropped my first EP around 98-99 with 6 songs. I recorded with my partner JJ Brown, we burned all the CDs, I sold them at the video store I was working at, and it started from there. BSF: What were you going by then? RG: By then I was R-Son The Voice of Reason. One of my homies came up with that. He said, “Man what do you think of that? You’re always the Voice of Reason”, and it just kind of stuck. From there we were doing shows at Penn State, the whole crew was 5G Productions because our producer lived in apartment 5G, so it kind of sprung out of there. BSF: And how did you get hooked up with Gangstagrass? Randy Green, aka R-Son – The Voice of Reason rocking the mike at a Gangstagrass performance. RG: Around 2011, a buddy of mine Dolio The Sleuth, who is in Gangstagrass with me right now, reached out to me because our lead singer in Gangstagrass, Brother Rench, was looking for somebody to tour with the band. We did a show on Wednesday night out in Philly and by the time the show ended the group was so dope. I hopped in the van with Rench and the three guys he was with at the time, and that weekend did 3 shows in North Carolina. 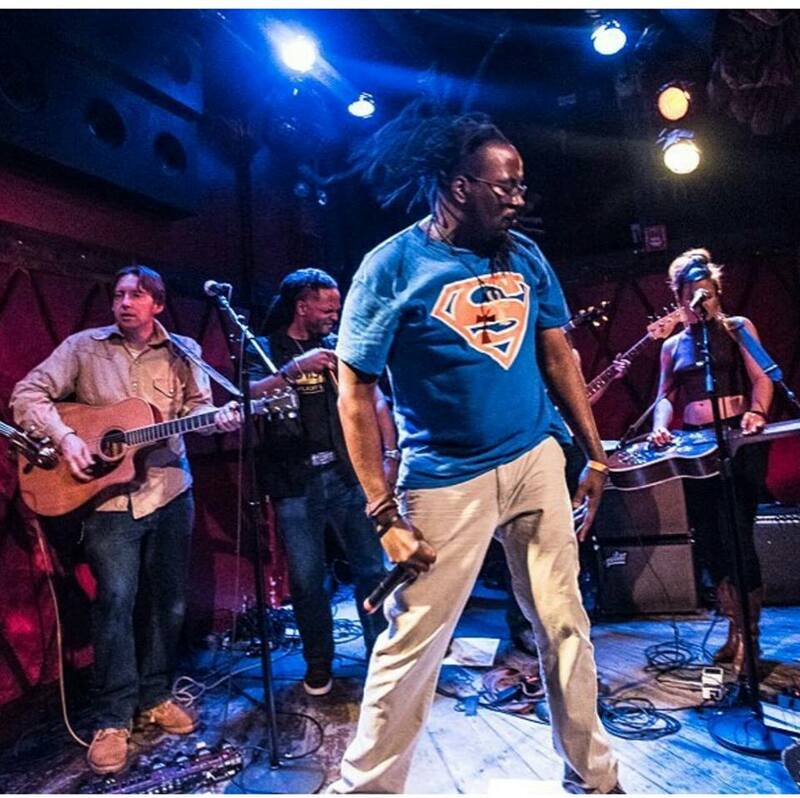 BSF: When Dolio came to you with the idea of doing Hip-Hop and Bluegrass, what was your response? RG: I trust Dolio, so when I first heard about it I checked it out and I was like okay let’s see what we can do with this. When we did the first show I was just rhyming in spots and I would just do a verse in freestyle by the end of the night. I was like okay I see how this works. To be totally honest if you put the pickers in the place of a sample or a loop, it’s the same basic concept as long as the drums are there it works. It usually doesn’t take long for most people. They either get it or they don’t get it, real quick, and when they get it they’re like “oh wow this is something else”. One of the things I’ve been telling people about the ideas of the two music styles is that they’re very similar, they’re both coming from places where the people that are making them, they’re making up stuff on the spot. A lot of it is improvisation. Whether it’s a bunch of cats on the corner freestyling or a bunch of dudes on a porch with their instruments just improving and picking, they blend much better than people would believe. BSF: I was going to ask, do you see a lot of pushback with “what’s Hip-Hop got to do with Bluegrass”? RG: In all the shows we’ve done I’ve encountered maybe three people, out of thousands. And I think they’re way more people that don’t like either one of these music styles, but have told me “yours for some reason works”. I’ve had a lot of Hip-Hop heads tell me “I don’t know what you’re talking about, but I heard it,” and at the end of the day the beats are hot. From a Bluegrass standpoint, we’ve encountered people that are very much into Bluegrass and that’s kind of all they know, particularly because of their age. I’ve had 75 year old white dudes come up to me at the end of the show and tell me “you know something son, that was amazing.” That’s all I want. Judge me by what I’m doing, not what you might think I’m doing. Once you experience it and you recognize what it is, then feel free to judge it. I’ve had a couple of friends of mine who are like “hell no”, but overall only a few, so I can handle that. BSF: All the Black Tribbles have a love of a particular fandom and comics seem to be your thing, specifically Superman. Why Kal-El? RG: I’ve been reading comic books since I was 5 and collecting since ’86. The two books that got me collecting; Thor #337 the first Walt Simonson – Beta Ray Bill stuff and Crisis on Infinite Earths #2. These were the first books that I was like “oh my God what happens next” and had to really continue the story. And when Crisis ended, and the Superman books restarted with John Byrne’s stuff, it spoke to me. I mean, I had always been a Superman fan as a kid but it spoke to me because the idea you have is this guy, and the only reason he gets up in the morning, if he wanted to, if he chose, he could do whatever he wanted to do and nobody can do a damn thing about it. His decision everyday is to try and make other people’s lives better. He helps other people deal with things that they can’t deal with. He’s not going to run your life for you, but only those things that we can’t deal with, be it an alien monster or some of the really classical Golden Age stuff, when he was taking down slumlords and stuff like that from a journalistic side, that’s powerful stuff. 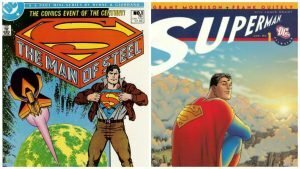 John Byrne’s Man of Steel #1, and Frank Quietly’s All Star Superman #1. Image credits DC Comics. When you look at it from that standpoint it becomes more important and meaningful, an idea that any of us can do that. We all have things or encounter people or situations that we’re the only ones that can help them and sometimes we do, sometimes we don’t, but it’s the kind of thing of “why don’t we more often”. That spoke to me in a space where, especially around that time, stuff was getting darker and more violent. The Dark Knight Returns was coming out, Spawn and Punisher were getting really big and that was cool and all, but there was another way to do this. And at the end of the day he (Superman) always winds up in that same place, regardless of how he does it, he’s always that guy you can count on in that situation where nobody else can do anything about it, he’s that guy. My favorite thing ever written by humans is All-Star Superman. I mean this is it. He’s dying but he’s like, “I have to do these things because this is how I do”, and for me that was it. 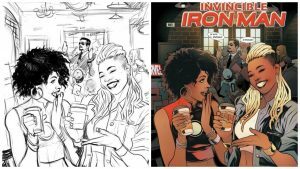 BSF: Amalgam’s Ariell Johnson is featured on an Invincible Iron Man #1 variant cover. Please talk about about how this came to be. RG: When Marvel does these store variants, they’ll reach out to any number of stores and say they’re “…interested in doing this, would you like to be involved?” And we almost said no because of the numbers they were looking at, the competition (comic book stores) does it all the time. They’ve got that kind of money, but we’re still relatively new to the game and we were hesitant. Then we were thinking about it and we thought these things are a pretty big deal, let me reach out to the guys at Marvel, fix some of the numbers and make it work. We were able to spread it out over a bit to take care of the cost and it just had to get done at that point. They offered us three different artists; Larry Stroman, JJ Jones and Elizabeth Torque. I recognized her name (Torque) looked up her artwork and I was like “this is fantastic so let’s go 3 for 3” with this one. We’re going to do a Black lady Iron Man (Riri Williams, a.k.a Iron Heart), the first Black lady on the East coast to own her own comic book store, and an amazing lady artist: let’s do it. We sent pictures and when they asked about cover ideas I was like “We’re a coffee shop, why don’t we have Ariell and Riri having a cup of coffee”? I didn’t know where it was going to go from there, but when we got the first sketch back we were blown away. She was in the store and the detail had the ductwork and the paneling. It was beautiful. BSF: What was the fan reaction like? RG: When they made the official announcement on abcnews.com, it was about 10 emails in about 20 minutes. I got emails about “how do I get this cover”. By the end of the day I had over a hundred emails. When the books came in we had a guy waiting in the store, people all over the world have been asking for it (Sweden-10, UK-5, Hawaii-3). I wasn’t expecting it but I’m very, very happy about it. And I’m glad they went with the idea of Ariell because she’s very important to what’s going on in the industry right now. I love the fact that I have a 13 year old daughter, and she’s been a comic book person her whole life. But there are little girls like her whose dad maybe isn’t a comic book guy, but now they’re seeing Ariell and Riri. Ariell tells this story about how in the 90’s, she saw Storm in the X-Men cartoon and was like “wow we’re superheroes too” and for that to be continuing and perpetuating on any level, to be part of that, feels really good. I’m excited every day I get up to go to work and encounter people that are excited about coming to the store and being involved and wanting to be a part of this realm. George Carmona 3rd is an Artist / Designer, former Milestone Media Intern, former DC Comics paper pusher, book lover, and lifelong comic and sci-fi geek. You can find his work at FistFullofArt.com or follow him on twitter at GCarmona3. Mega Man Now On IOS and Android! George Carmona 3rd is an Artist/Designer, former Milestone Media Intern, former DC Comics paper pusher, book lover and lifelong comic geek. You can find his work at FistFullofArt.com or follow him on twitter at GCarmona3. THE UNDERFOOT: THE MIGHTY DEEP AVAILABLE EVERYWHERE NEXT WEEK, WITH AN OFFICIAL LAUNCH PARTY AT AWESOME CON!